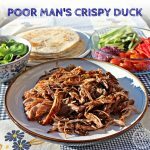 All the flavours of crispy duck with pancakes but with pulled pork and flour tortillas - just fab! Salad vegetables of your choice cut into strips or as appropriate eg cucumber peppers, spring onion, red onion, baby salad leaves, cherry tomatoes etc. Place the pork leg in the slow cooker and spread the hoisin marinade or sauce all over the joint. Add 100 mls of water to the crock pot. Cook on high for 4 - 5 hours or low for 6 - 7 hours or until cooked. Once tender and falling apart to the touch remove and shred the meat between 2 forks. Pour some of the cooking liquor over the meat. Dry fry each of the tortillas (I use a ceramic pan, you shouldn't use non-stick without oil) until if puffs up, turn and cook for a few more seconds to heat through. Serve the stack of tortillas, salad items in bowls and platter of meat at the table. Allow your guests to assemble their tortillas with a line of meat and salad down the middle and finish with a drizzle of hoisin sauce. Roll up and enjoy just like a crispy duck pancake.